From 2007-2018, mushroom industry got rapid growth in Guan’nan County, by now, over 44 industrialized mushroom enterprises have been established within the county, varieties cover King oyster, Button, Enoki and others. In 2017, gross output on fresh mushroom came to 580,000 tons and output value hit 5 billion CNY in Guan’nan County. And from January to August of 2018, the county also gathered 396,000 tons of gross output and yielded 3.6 billion CNY of output value. Guan’nan County holds a long history on aspect of mushroom production. Over the years, Guan’nan County closely combines with local reality, insists on grasping mushroom farming as the leading industry that optimizes industrial structure and promotes modern high-efficiency agriculture. Now, mushroom industry is leading the rapid growth trend in Guan’nan County, degrees of industrialized mushroom clustering rank first in China while output value is in amplification year by year. Guan’nan County, Jiangsu Province of China situates in Southern margin of the North Temperature Zone, it is born with warm and wet monsoon climate condition, sufficient rainfall, wet environment and it quite fits for mushrooms’ growth. Over the years, mushroom industry has been showing the rapid growth within the county. In modern agricultural garden zone of Guan’nan County, there gather over 50 enterprises engaging in industrialized mushroom production, in one of the most prestigious enterprises referring to Jiangsu Yuguan Modern Agricultural Technology Co., LTD, King oyster mushroom and Button mushroom are showing desirable growth tendency in the workshop. “We are the most advanced and the largest enterprise specializing in domestication and production of White mushroom in China, in our workshop, at least 8 batches of production could be realized per year, and average daily output on White mushroom reaches nearly 100 tons, fresh mushrooms are sold well to the majority of cities in China while canned mushroom products gush into America, Canada and other nations and regions. The minimum annual sales value hits over 100 million CNY,” introduces Mr. Chen Jinhe, vice general manager of Yuguan Company passionately, adding that in 2017, gross foreign exchange earnings on mushroom export reached 4 million USD. 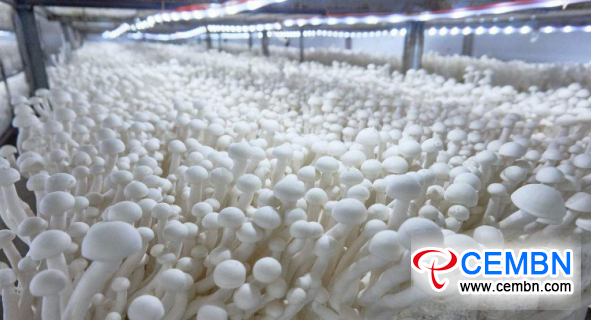 Nowadays, degree of industrialized mushroom enterprise clustering of Guan’nan County ranks first in China, gross output on King oyster mushroom, Button, Enoki mushroom and other varieties comes to 580,000 tons per year while annual output value reaches 5 billion CNY. Button mushroom picking reaches its peak time in Jiangxi Zhongtian Modern Agriculture Co., LTD.